Be the first to share your favorite memory, photo or story of Bart. This memorial page is dedicated for family, friends and future generations to celebrate the life of their loved one. Westminster - Bart Keith Beck, 84, loving husband of 61 years of marriage to Betty Jean York Beck, of 11720 Long Creek Hwy, passed away, January 14, 2019, at his residence. Born in Stephens County, GA, he was the son of the late Tommie Beck and Rosa Bell Cooper Beck. Bart worked in textiles and was retired from J.P. Stevens. He was of the Christian Faith and was a Veteran in the United States Army. 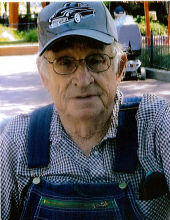 In addition to his wife, Mr. Beck is survived by a son, Russell Beck (Samantha) of Long Creek, SC; daughters, Judy Black (Denver) of Canon, Ga and Joyce Rogers (John) of Tamassee, SC; eight grandchildren; numerous great-grandchildren and two great-great grandchildren; and niece, Sara Ruth Jennings. In addition to his parents, he is preceded in death by a brother, Oscar Beck and sister, Sara Ruth Beck. Mr. Beck was the last surviving member of his family. A funeral service will be held 2 pm, Saturday, January 19, 2019 at Sandifer Funeral Home Chapel with burial to follow at Unity Baptist Church Cemetery. The family will receive friend’s 6-8 pm, Friday, January 18, 2019 at Sandifer Funeral Home. The family is at the residence. Flowers are accepted. Condolences may be expressed online by visiting www.sandiferfuneralhome.com. To send flowers or a remembrance gift to the family of Bart Keith Beck, please visit our Tribute Store. "Email Address" would like to share the life celebration of Bart Keith Beck. Click on the "link" to go to share a favorite memory or leave a condolence message for the family.